This is the second in a series of training lessons on marine wind and waves. The first lesson discussed wave types and characteristics and is a good primer to this next marine training topic. 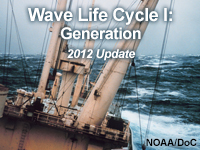 Wave Life Cycle I: Generation examines how wind creates waves and the inter-relationships between wind speed, wind duration, and fetch length during this process. These three factors are important to predicting wave height and what will limit wave growth. Additional topics include fully developed seas, observation sources, and various special wind events such as coastal jets and instability mixing in the marine boundary layer. While much of this instruction is at a basic level, all marine forecasters will find benefit in the more intermediate and advanced topics. These include the issue of dynamic or “trapped” fetch as well as the use of satellite-based observations of marine winds using the active microwave technique known as scatterometry. User interactions are included throughout the lesson and within the short case study. The next lesson in the series will look at propagation and dispersion as the waves leave the generation area. Describe how wind generates waves, including how wind speed, fetch length, and duration interact to affect the wave growth process. Use a wave nomogram to manually estimate wave height. Describe the remote sensing and numerical prediction tools that aid forecasting of wave generation. List in situ as well as remote sensing sources of wind observations and describe their capabilities. Recall some of the various special wind events such as coastal jets and instability mixing in the marine boundary layer that affect wave generation. Describe the issue of dynamic or "trapped" fetch. August 2012: This module has been updated to provide greater flexibility in navigation and linking to specific content. In addition, minor changes have been made to improve the clarity of the content and correct inconsistencies. However, these changes do not affect the overall substance of the material taught.